Maintain Cleaner Air Quality in Home, Industrial Workshops or Laboratories with this Top-Rated Dust Collection Work Bench with Static Control Rubber Mat. Here We Offer The Best Portable Dust Removal Desk with Your Choice of Reusable Shaker Filters or High Quality HEPA System That Quickly Extract Particles from Wood Working, Carving, Grinding, Sanding, Sawing, Cutting & More--All at A Discount Price with Free Shipping and 100% Made in USA! Pull out dust drawer with a holding capacity of 0.9 cubic feet of dust! Typically used for light to moderate concentrations of dry contaminants, the DD-800 is the AER Control Systems Dust Cab 800 Dust Collector with a downdraft table top mounted on top. The DB-800 is compact and portable, the top is an aluminum surface with non-sparking rubber mat to protect against parts that cannot be scratched and can support a table load of 50 pounds per square feet maximum. The top has a back enclosure with a light fixture and hinged side wing panels. The filters in the Downdraft Bench 800 are shaker style with standard cotton sateen bag material and cleaning is accomplished using a foot pedal to wrap the bottom of the bags. The DB-800 has a design airflow of 800 CFM (250 feet per minute), which is strong enough to keep a variety of dust particle types out of your way. The DB-800 is designed to be powered up as soon as you receive it by offering a power cord and switch operating at 115 volts. Optional rubber mats and other surface types are available for placing on the table top. 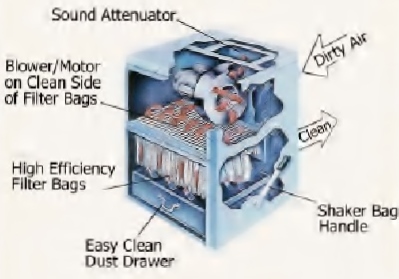 The DD-800 Downdraft Table System is one of the best quality, lowest cost dust collection work stations on the market. Order yours today! At our online store, we make it easy for you to get the best commercial and industrial air filtration systems at discount prices with free shiping due to our extremely low overhead. Call us today at 1-800-701-2513 to discuss your application. We are here to help! 1 Power Cord and Switch.